.. from the southwest corner looking north. The four headstones in the foreground are nos. 11, 12, 13, and 14. .. looking north from about midway. The headstones in the immediate foreground are Nos. 11 and 12. In the background is no. 1, Nathaniel and Ellen Miller's monument. .. looking south. Pictured is local resident Faith McCutcheon. .. from the southwest corner. Scrub growth has taken over about a quarter of the site, which could be easily controlled by 2-3 times a season mowing. .. from the northwest corner looking to the south. The small stone in the foreground is the pet stone No. 16, Jinx. To the left is No. 9. .. looking north. The three stones to the left are nos. 11, 12 and 13 on the key map. While the gravestones remain in fairly good condition, the lack of routine maintenance is evident in the increased amount of brush growth. The Miller Family Cemetery is an approximately 50 ft. east-west x 85 ft. north-south plot located about 400 ft. east of Fire Place Neck Rd., between the Brookhaven Elementary School property and Brook Nursery Rd. (at the rear of 19 Fire Place Neck Road, just east of the large sump). While there is a right of way from Fire Place Neck Rd. 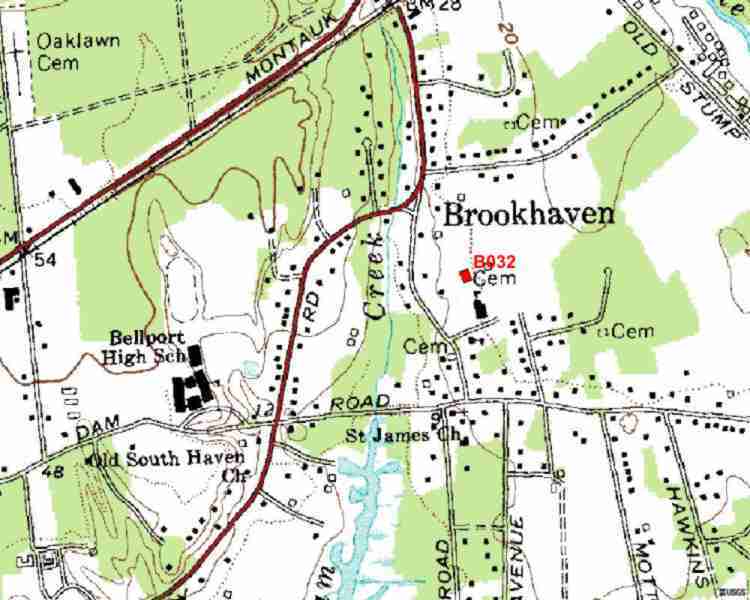 to the cemetery just north of the residential property at 19 Fire Place Neck Rd., it is not passable; access the the cemetery is gained through a gate in the chain link fence on the north side of the Brookhaven Elementary School parking lot. This land was once all the Miller family farm, then became the Brook Nursery. It is now mostly residential housing. The cemetery also contains two pet gravestones. See key map. The cemetery is surrounded by its own chain link fence in fair to good condition. Some maintenance is provided by members of the Fire Place History Club, No recent maintenance appears to have been provided by the Town of Brookhaven. The gravestones are in relatively good condition, considering the age of some of the stones, although two have become difficult to read. This cemetery is #32 on the c. 1939 Town of Brookhaven Historian's Cemetery List and has Historic Site ID Br30C.1-S.